All of the time that I've spending thinking and researching Irish paintings and art has made me want to create some art or a painting of my own. I decided to not be too picky about what type or anything and just let my creativity flow. I've been addicted to Astarte's Mega-Zine. I can't even explain how cool all of the issues are. For those of you who don't know Astarte's Mega-Zine is an online magazine is stuffed full of art tips and information about art and paintings. You can check them out here or click the image at the bottom. I have found all of their issues to be really helpful. Right now I don't think I'm good enough to post pictures of any of my attempts at Irish painting and arts, but maybe soon. I would definitely recommend you check out Astarte's Mega-Zine, its very inexpensive and definitely full of lots of helpful things and a great deal. I can't want for the next issue. Irish paintings and art can be wonderfully captivating when the artist levies the natural beauty of the landscape. 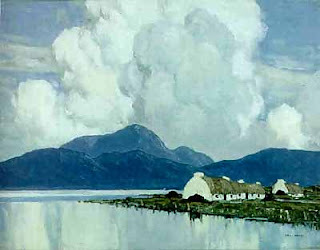 For example, the painting to the right, called In Connemara by Paul Henry showcases the exquisite hills by the water. In addition I like this piece because of the detail in the building and the fluffy white clouds. Although this is a great piece of Irish painting/art, it is probably not my favorite piece. This portrait is my favorite Irish painting so far. The painting is called Molly Macree and was done by Thomas Alfred Jones in the 1860's. Its currently held in the National Gallery of Ireland in Dublin. Hopefully some day I will be able to go and visit this gallery. I'm sure that there are lots of Irish paintings and Irish art in there that I would enjoy. In addition to Irish paintings and art I am interested in the art and paintings of other countries. You can see some of my other work at these blogs. As you can see my interests are varied and include the painting and arts of many different countries. Right now I am focusing on Indain, Renaissance, Chinese, Mexican, and Irish paintings and art. 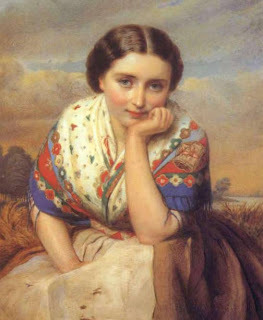 Welcome to my blog about Irish paintings. Stay tuned for more to come.